Close your eyes and imagine a city in which farmers stroll side by side with wide-eyed college students, neo-gothic cathedrals share space with modern high-rises, temperatures never get too hot or cold, and modern conveniences coexist with breathtaking nature. This place isn’t imaginary; it’s real. It’s Manizales, where traditional folks meet at the crossroads with youthful dreamers, and where an entire community relishes the past, while embracing Colombia’s bright future. With a population under 450,000 people, you won’t have to fight your way through crowded sidewalks or sit in frustrating traffic jams in Manizales. Daytime highs rarely exceed 72 F and 53 F lows give you an excuse to show off your favorite sweater. 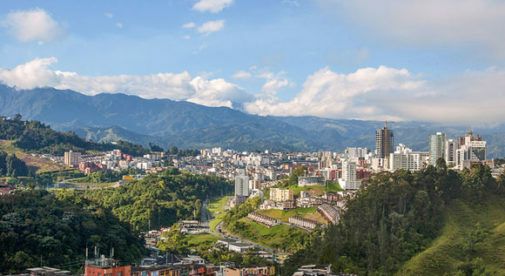 Best of all, Manizales offers an affordable, relaxed lifestyle, with all the amenities you’d find in larger cities such as Bogotá, Cali, and Medellín. It’s the type of place I love most, with a comfortable climate, warm people, and loads of things to keep me busy. Manizales is a city of contrasting styles, people, and landscapes that blend to form a symphony of harmonic living. Colombians refer to this unique urban center as “The San Francisco of Colombia” for its steep hills and spectacular views. And believe me—a former San Franciscan—the label aptly fits this Colombian jewel. In Manizales, you can sit in a Swiss café, enjoying a delicious pastry, while never forgetting where you are: Colombia’s Coffee Triangle, made evident by plantations visible on surrounding mountainsides. Six universities, including the University of Caldas, make Manizales their home. Wherever you look, you’ll see enthusiastic students, with an infectious eagerness to make the world a better place. The University of Caldas operates a variety of public institutions, including science, archeological, art, and natural history museums, along with a botanical garden, which all residents celebrate and enjoy. But Manizales doesn’t solely rely on its universities to deliver cultural attractions. In September and October, Colombians from all over the country travel to Manizales to enjoy jazz and theater festivals, and in January, Manizales crowns the international coffee queen, in a pageant that coincides with the bullfighting season. Colombians refer to Manizales as “The San Francisco of Colombia” for its steep hills and spectacular views. As the capital of the Caldas department, Manizales has a regional medical center and offers a host of shopping and dining options. In the Milan district, you can dine on fine Spanish cuisine, gourmet pizzas, Mexican and Chinese food, and traditional Colombian dishes. Steps away, in the El Cable neighborhood, Manizales’s most popular entertainment district, young and old gather daily at Colombian- and internationally owned cafés, restaurants, and bars. 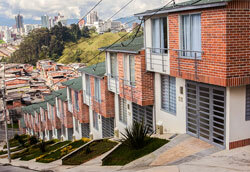 Manizales’s inner-city neighborhoods, such as La Estrella, Palermo, Milan, El Cable, and Chipre, hold a mix of architectural styles, with pristine lawns, and affordable prices. Older homes start at around $80,000, modern high-rise condominiums run $100,000 and up, and rents begin at around $325. Colombians love creativity, so it’s common to find an eclectic mix of home styles in the same neighborhood, from English Tudor to Art Deco and traditional Spanish to modern glass and steel. When I visit Manizales, I usually stay in the hillside home of Colombian friends, who live in a three-bedroom townhouse in a lovely working-class neighborhood. They pay less than $150 in rent, but have breathtaking views. How can you beat that? And, while Manizales offers the best of urban living, you’re never far from spectacular natural environments. In fact, Manizales has large, natural green spaces all over town. From El Cable, you can hop on a cable car to Parque Yarumos, an enormous city park, with miles of nature trails, an amphitheater, a restaurant, and a nature museum. Or, for the ultimate adventure, take a trip to Los Nevados National Natural Park, a 45-minute drive from the city, where you’ll find lakes, rivers, wilderness, and three volcanos. But you might want to wait a while before trekking to the dome of the Nevado del Ruiz volcano, because that geological beauty has been letting off steam lately. Life is always so exciting in Colombia!